30 tons per axle, the LP600-15T is designed for weighing heavy vehicles on unimproved surfaces. The system weighs axle-by-axle in static mode using two 15T scales, while extension levelers keep axle groups on a level plane. System consist of scales, two pairs of levelers per scale and appropriate indicator. 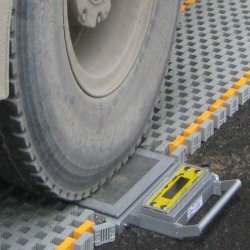 Intercomp LP600-15T scales are a great choice to protect roads from overload damage and safety hazards, portable scales allow enforcement capabilities to go to locations not served by permanent weigh stations. Providing a weighing capacity of 30 tons per axle, this system is designed for weighing heavy vehicles on unimproved surfaces. The LP600-15T™ system weighs axle-by-axle in static mode, using just two scales, while extension levelers keep axle groups on a level plane, providing ±1% accuracy. The scales and CPU communicate via Intercomp’s RFX™ Wireless Weighing Technology and are powered by commercially available batteries for up to 200 hours. Systems consist of two 15 ton capacity scales and two pairs of roll-up ramps with levelers. Systems can be transported in the trunk of a vehicle and set up by 1 or 2 people in under fifteen minutes. 182002 ............. LP600-15T Scale System 22" x 14.75" x 1.7"
182003 ............. LP600-15T Scale System 30" x 14.75" x 1.7"